Italy brings us the band of many facets, Holy Knights. They have been apart for some time, but found each other again and put their thoughts together to make this new album called Between Daylight And Pain. The trio composed 8 songs with great inspiration from the material that comes from Dream Theater and Royal Hunt, symphonic multi metal as a result. 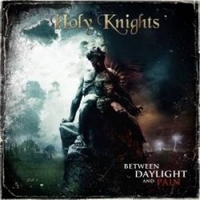 Their strength is a very good guitar and vocal performance, and first off is Mistery where Holy Knights gives it full speed in their symphonic power metal and no letting the foot come off the gas pedal, a brilliant opening for this album. More mist comes as Beyond The Mist beams the searchlight forward in a fairytale mid-tempo song created in the symphonic atmosphere known from Dream Theater. Glass Room is good and melodic with orchestral building and a monster guitar solo. If you like the music from Royal Hunt you should definitely listen to Glass Room from Holy Knights. Another good song is Awake which goes in the hard heavy metal direction, and like the song Mistery there is no slowing down on the tempo, they give it all they got. This is a CD that is filled with fantasy fairytale music which is good and acceptable, but only has 8 songs, and maybe could disappoint a little there. But let us wait and see what Holy Knights will bring next, now they are back together again.